All over the blogosphere, I have seen many holiday dress guides. However, I feel as if there is definitely a distinction between a Thanksgiving dress and a holiday dress, anyone agree? I am one of those people who is avid about not forgetting Thanksgiving. The tree goes up after the fourth Thursday of the month, ok! I love that so many brands are coming out with lovely holiday dresses, but most people probably don't want to wear super shimmery, velvety, or frankly formal dresses to Thanksgiving dinner. 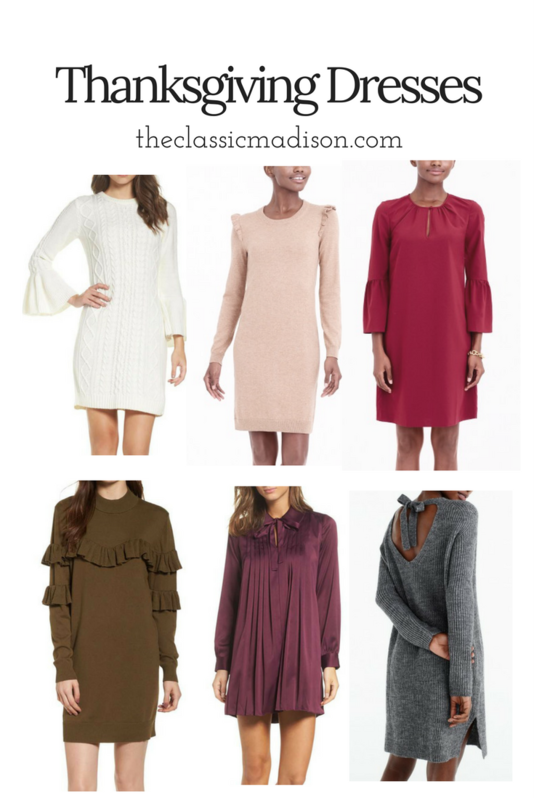 Today I thought I would share couple of dresses perfect for Thanksgiving dinner (or brunch) that are casual and dressed up just enough! I love wearing sweaters, tunics, and tights for Thanksgiving. Even though it's normally hot on Thanksgiving where I live (usually around 60s-70s!) I like to add in a bit of Thanksgiving flair to my outfits. That includes any sort of sweater material, tights if it's not too hot, and warm fall colors. I haven't picked out my outfit yet for this year, but I have a feeling it will include a variety of fall colors and accessories. So get Thanksgiving dress shopping and enjoy the fall weather and foliage while it lasts! Christmas will come- but be patient because Thanksgiving is a wonderful holiday as well that deserves its own decor and festivities. Loved this post Madison! All of these dresses are so cute!